Formerly Brookside, Wesley Street has changed very little over the last two hundred years. It has a number of significant buildings. A row of cottages stand opposite the former Wesleyan School. This was originally a mill, built in 1783 . Benjamin Rolfe was the first tenant and the mill was to become known as Rolfe’s Mill. The business employed a total of 10 people, though it is likely that initially some were domestic spinners, using the Hargreaves Hand Jenny at home. The workforce was engaged in preparatory work opening, carding, drawing which required a great diversity of machinery. The mill had a working life of 22 years (1785-1807) and it would seem to represent an intermediate stage between the systems of domestic and factory production; with a group of people performing under one roof. Rolfe must have been successful because within seven years he had transferred his business to Hawkshead Mill. The mill owner, William Sheppard, ran his own business from here after Rolfe left and on his death his sons moved the works to the nearby and much larger Shepley Mill (aka Meadow Mills). 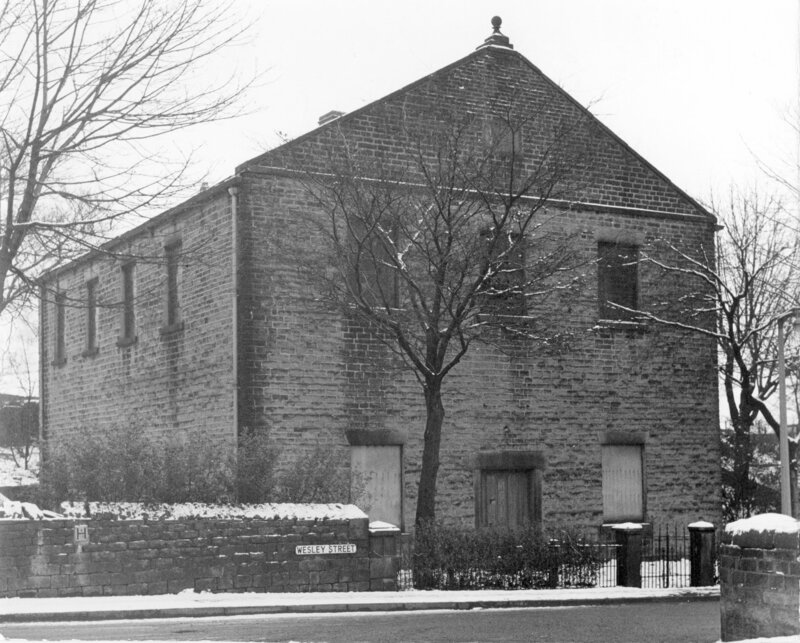 The building, on the left of the image, with the gable end sticking out into the street was the mill’s warehouse. In later years this building became the Duke of Norfolk’s infant school. 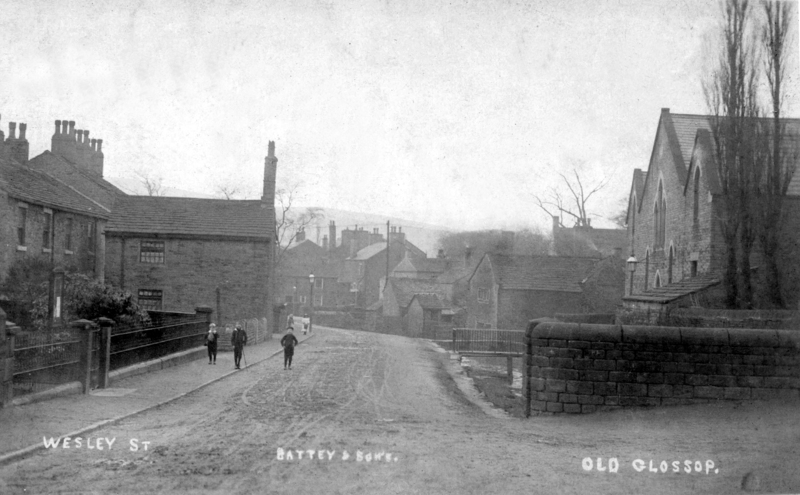 In the book called ‘I remember – reminiscences of Glossop before the First World War’ Miss Bennett reminiscences about her days here. The Weslyan Chapel, opposite the junction with Wellgate, was built in 1812/13. Until that time the congregation held services in a room near the Old Cross. As the audio trail reveals, Wesley Street (Track 8) has seen its fair share of other businesses, and celebrities.